Author, historian, heritage practitioner and former Chairman of VASSA, Dr. Hans Fransen’s contribution to the literature and understanding of the material culture of the Cape has been extraordinary. He has written extensively on the architectural tradition of our vernacular heritage and linked the development of architecture at the Cape to trends and architectural movements both in Europe and in the former Dutch colonies. 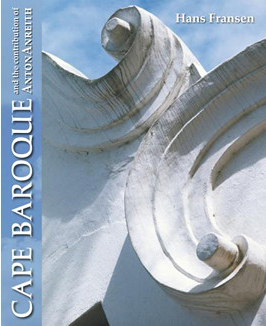 In his latest book, ‘Cape Baroque and the contribution of Anton Anreith’ (2014) he examines the architecture and the furniture at the Cape in the 18th century to show that they form part of a much broader development of Baroque that spread across Europe, initially as a response to the strictures of Calvinism in Catholic countries of Europe. He will be speaking on the themes that he explored in his book which will also be on sale at the meeting. “Hans … started out as an ‘outsider’: he was born in Amsterdam and emigrated to South Africa (as an assistant land-surveyor! ), aged 24. Ever since then he has been engaged with Cape cultural and art history… He went on to author a stream of books, chapters and articles that cover the breadth of Cape culture… all contributing to a rich, in-depth picture of the Cape scene”. Hans Fransen (2014). Cape Baroque and the contribution of Anton Anreith. A stylistic survey of architectural decoration and the applied arts at the Cape of Good Hope 1652-1800. Published by rapid access publishers, Stellenbosch. It is that time of the year again! Please join us for our outgoing Chairman, Thys Hattingh’s report on the activities of the Society. This will be followed by the election of a new committee for 2015-16, with a number of vacancies as a result of committee members who are standing down. The AGM will be followed by refreshments, kindly organised by Helen Binckes.